Nip-sensitive cats will go crazy for Trish & Aidan Iriye-Robson's handmade, catnip-stuffed toy slice. Crazy for pizza? OK, but we bet you've never flipped over, rolled around, rubbed against, and drooled over a slice. (Not that there's anything wrong with that.) 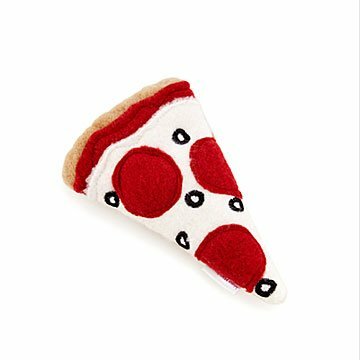 Featuring applique and embroidered toppings on fleece sauce and cheese, Trish & Aidan Iriye-Robson's handsewn pizza slice toy, stuffed with organic catnip, will bring 'nip-susceptible cats to temporary ecstasy. A fun crunchy tucked inside makes exciting, extra crispy sounds when kitty chews. Crack yourself up saying, "You eat like an animal!" (Hey, it made us laugh. One of us, anyway.) Handmade in Vallejo, California. We got this as a gift, and our kittens LOVED it, and still love it nearly 9 months later! I've never seen them play with a catnip toy more consistently throughout this long of a period of time. It is by far their favorite toy, which is why I will be buying a few more for them! The kittens carry this slice around and we'll often find it hidden somewhere for safe keeping. BEST cat toy for you to get for your kitty or give as a gift! If you love pizza and love cats, this is a purrfect gift! Vastly entertaining! Especially if you are eating ðŸ�• yourself! I'm back to buy another slice. I bought this for my niece's newly adopted kitty who loves pizza! My kitties found it, chewed the package open and have been chewing on the toy all morning. I took it away from them, but gave it back after I decided I couldn't give it to my niece's cat. One cat has now taken and the toy and "hid" under his bed!! !